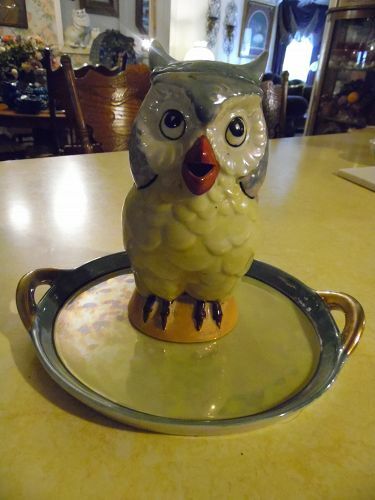 Vintage Lusterware owl decanter with original tray. Double Diamond TT Japan mark on both pieces.Both pieces are perfect. Decanter measures 7" tall Tray has a diameter of 9" from handle to handle. 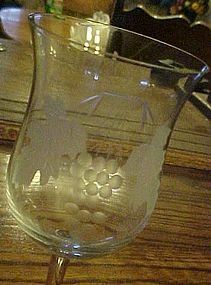 (Originally this had 4 little lustre shot glasses) which are no longer with the set. One small rub on the tray handle. All other paint is wonderful. No chips or cracks. This is an awesome set. Very unique. Collectible bottle from Greece. 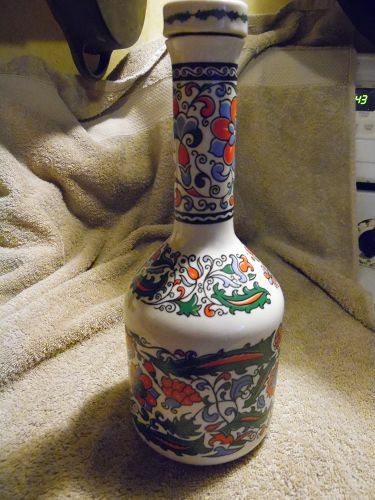 METAXA Hand Made Porcelain Bottle Decanter ~ W/Lid ~ "S & E & A METAXA Very Old on the stopper.Vintage and very colorful. Measures 10 1/2 inches tall. No chips or damages. Clever way t carry your flask. 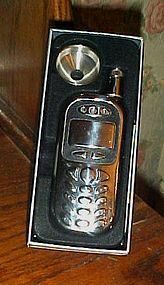 Chrome cell phone flask nicely boxed with funnel. Screw off ca on the antennae area of the flask. Never used.4 " tall plus antennae, size of a real phone. Pristine condition. 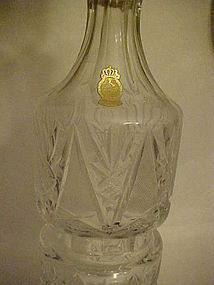 Here is a charming frosted Scotch decanter from the Gay Fad Studio. The decanter features a Gay Nineties piano player. Musical note and spilling mug of beer in the background. 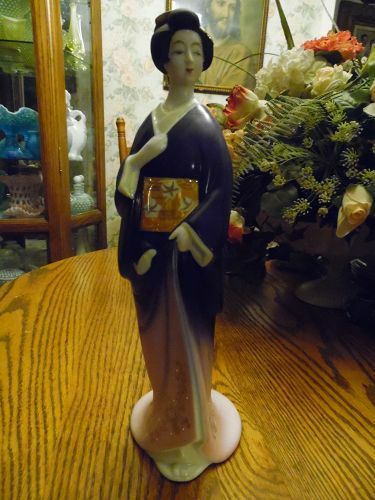 This colorful decanter is in wonderful condition, no chips or marks. 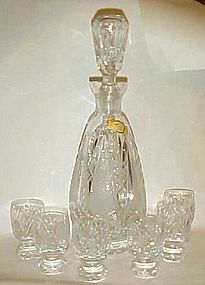 The decanter and stopper is in good condition with no chips or damages. 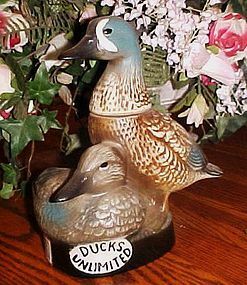 Graphics are bright and crisp.Height: 9 3/8" tall with stopper.Width: 3 3/8"
This is a truly beautiful and unique vintage Old Forester whiskey decanter. This 1960's piece is made of gorgeous iridescent and quilted marigold carnival glass, kind of an english hobnail pattern. 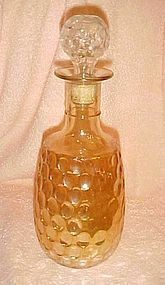 The stopper is made of clear diamond quilted glass with the cork on the inside.Measures 10 1/8" tall. Excellent condition. 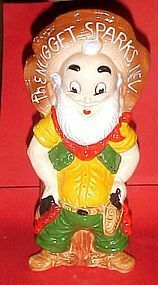 Original vintage LAST CHANCE JOE or "Sparky" Nugget Whiskey Decanter Sparks NV 1960s, Cameo Collector Series Whiskey Decanter from THE NUGGET Sparks, NV. Once contained Kentucky Straight Bourbon Whiskey, bottled by Cameo Distilling Co. Los Angeles, California expressly for John Ascuaga's Nugget Sparks, Nevada. Measures in inches 10.5” x 4” x 3.5”. Original cap/cork stopper, Nice original label, and most of tax stamp. Excellent condition. 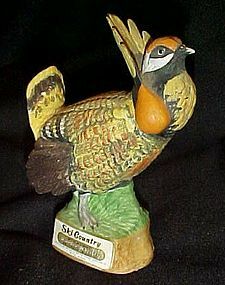 Mini porcelain Prairie Chicken decanter by Ski Country that was released in 1977 with only 2016 of this size produced. 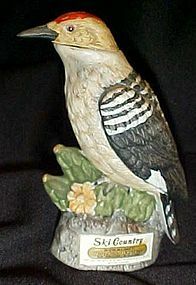 This has no chips or cracks or original box, but PERFECT, It is 5" tall and 4" wide. 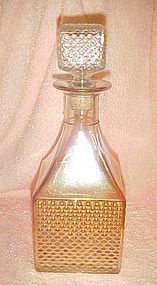 Ski Country Limited edition miniature whiskey bottle from 1983. 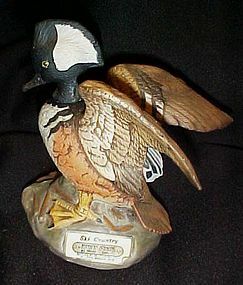 This is the Male Merganser duck, and only 1200 were made. Signed on the bottom by the artist. Measures just over 5" tall. This one is in PERFECT condition.